→Cat X-Ray Cost – Will It Break the Bank? Cat X-Ray Cost – Will It Break the Bank? It happened. Suzy was riding her bike in the front yard, and you shouted at her to come in for dinner. She began riding her bike up the driveway and into the garage, but disaster struck before she could finish putting her bike away. Will an X-Ray Break the Bank? Oliver, your furry friend of seven years, was lying down halfway under another bike. Suzy didn’t see him and rolled right over the middle of his body with her front tire. You heard a piercing scream come from the garage before the meowing began. Suzy was crying and screaming as Oliver meowed in misery. You immediately drove your favorite feline to the vet, but thoughts about cat X-ray costs began to cross your mind in the middle of the mayhem. Horror stories friends had told you of astronomically high vet bills began swirling through your mind. You loved Oscar and all, but a couple of thousand dollars is a lot of money. Before we dive any further into our hypothetical story, there is some good news. Cat X-ray costs don’t come anywhere near $2,000. 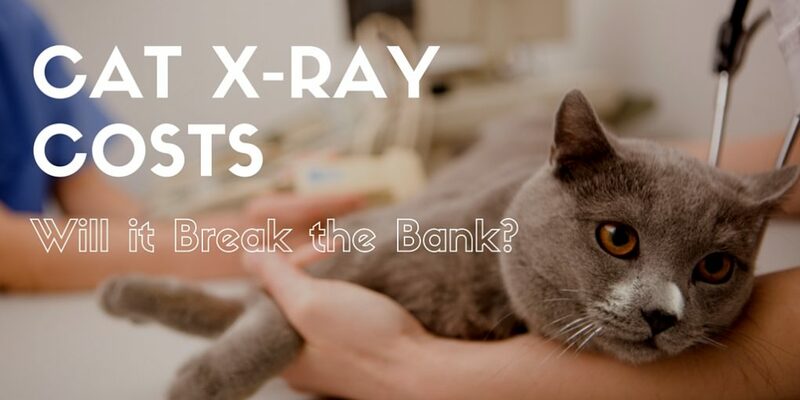 While an X-ray for you cat may not be dirt cheap, it shouldn’t completely break your bank. An X-ray is a particular type of radiation referred to as electromagnetic waves. Through the use of these waves, the X-ray can create images of the inside of your cat's body. These images will show the veterinarian different parts of your cat's body in black and white. Different types of tissues found in cats show up with different amounts of radiation – which causes the difference in colors. The average cost of X-rays for cats will vary wildly depending on a number of factors. A vet in rural South Dakota probably charges less than a vet in Los Angeles for an X-ray. While prices vary, we have found the average price for a cat X-ray to range from $70 to $250. These prices are for the X-ray alone. They do not include sedation (if your cat won’t stay still), blood work (if the X-ray reveals an issue), or services rendered once the X-ray finds your cat’s health problem. Cat X-rays for the abdomen and chest areas of your cat often range from $100-250. Smaller areas, like a cat’s extremities, usually ranges from $70-150. Dental X-rays for your cat typically run from $75-150. Cat X-rays are used to diagnose many issues your cat could be suffering from. Occasionally, a vet will request an X-ray during a check-up appointment to ensure your cat is healthy. This is especially important for older cats. Cat X-rays of the chest are often used to diagnose asthma, tumors, broken ribs, heart disease, pneumonia, and more. Cat X-rays of the abdominal area can be used to check for organ damage, bladder, problems, kidney disease, and more. Cats also have a need for dental X-rays (like humans) to check for teeth and gum related illnesses. Many times a cat will eat something it should not have (like a small cloth or toy), and it will get stuck in their stomach. An X-ray could help determine the problem. If your furry friend suffers a potential broken bone, then an X-ray will be on the docket, too. You may get an X-ray for your cat on his or her yearly check up. Dental X-rays for cats can be done once every two to four years, depending on the age of the feline. Both of these X-rays are completed due to preventative reasons. If your cat is hit by a car, bike, or another moving vehicle, then an X-ray is usually a good idea. 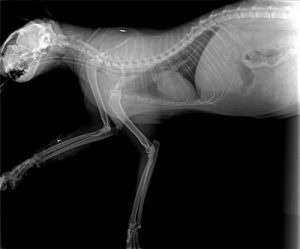 If your cat has fell ill for an extended period of time, an X-ray is often the first step a vet will take to figure things out. An X-ray (or a few of them) for your cat can be expensive. While one X-ray may only cost you $70 or $80, there may be times when you’ll be faced with a $300-400 bill. So it can break the bank, but it depends on the situation. The best course of action for budget conscious cat owners is to call around when you think your cat needs an X-ray. Every vet will have different prices. So call four or five vets in your area and see what type of feline X-ray pricing they offer. Shop around and find a vet in your area that is reasonably priced, yet still well rated, and you’ll feel much more comfortable with spending the money to help your cat out.